[ABRAHAM LINCOLN]. Newspaper. 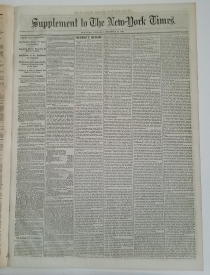 New York Times, New York, N.Y., Dec. 10, 1863, with “Supplement to The New York Times” complete with its own masthead. 12 pp. 14¾ x 21 in. Throughout the fall of 1863, eventual Union victory became increasingly clear, and on December 8, 1863, Lincoln issued his Proclamation of Amnesty and Reconstruction. This lenient plan that offered citizens of the rebellious states full pardons, voting, and property rights (except possession of slaves), encouraged the states to begin addressing the issue of the freedmen and women without compromising their rights, and allowed a former Confederate state to hold elections and form a pro-Union government once 10% of the number of voters in the 1860 election swore loyalty oaths. 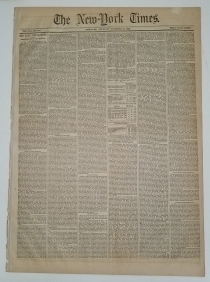 Commonly called the “Ten Percent Plan,” it reflected both Lincoln’s charitable view of Reconstruction as well as the reality that heavy penalties, denial of voting and property rights to rebels, and impoverishing the South was no way to rebuild a nation after a war fought, at least initially, to preserve the Union.